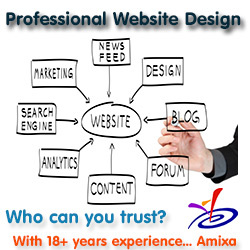 After a short drive we’ll acquire images for context and targeting. 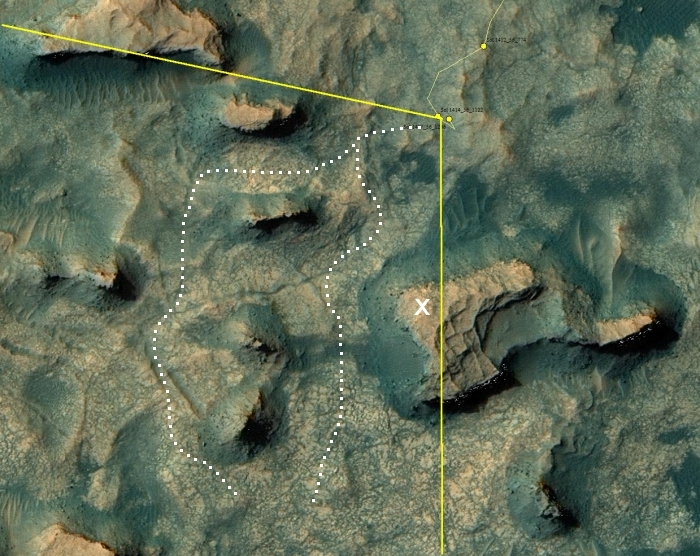 Overnight, Curiosity will complete a SAM electrical baseline test to monitor instrument health. 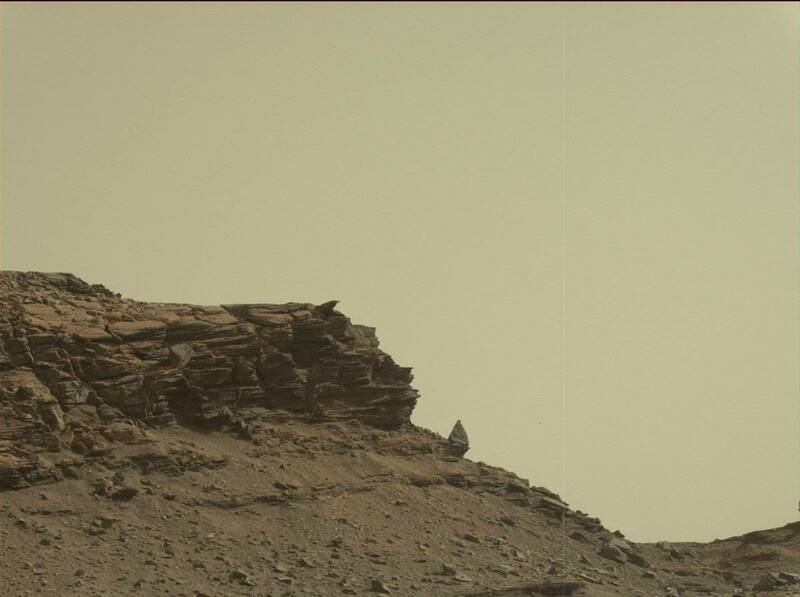 Based on some of the recent Mastcam images that we’ve acquired…, the view ahead should be quite scenic as we drive through the Murray Buttes! 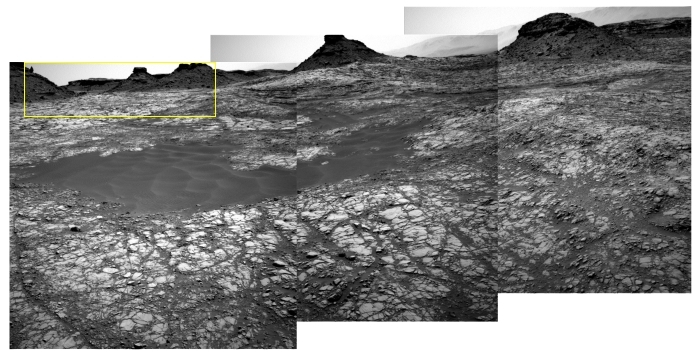 The image above is a close-up of those Buttes, showing Balanced Rock on the left, taken from one of three raw left navigation images. The image below is a panorama I have created from those navigation images, with an inset box to show the location of the above picture. 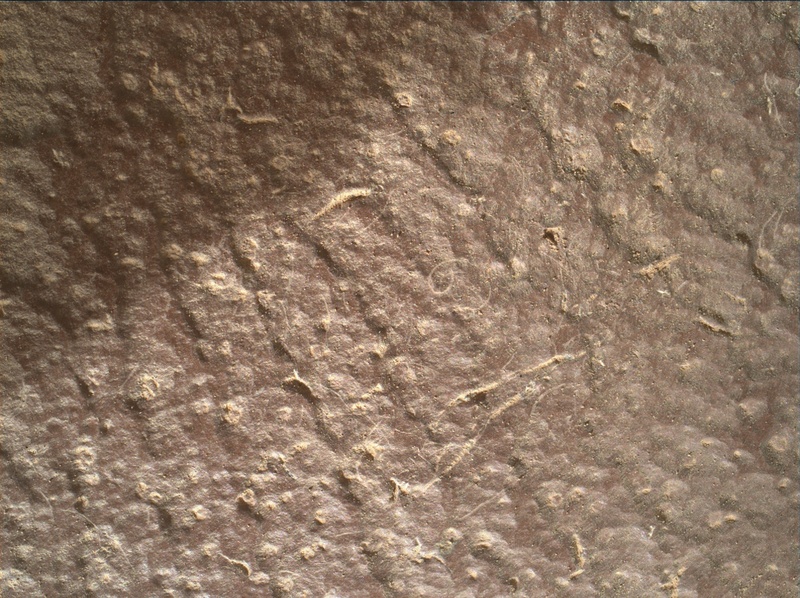 It appears, based on all of the images they have taken in the past day, Sol 1427, that they are trying to decide how to get around that small patch of dark sand directly ahead, and whether they can drive Curiosity through the gap in which the balanced rock is located. 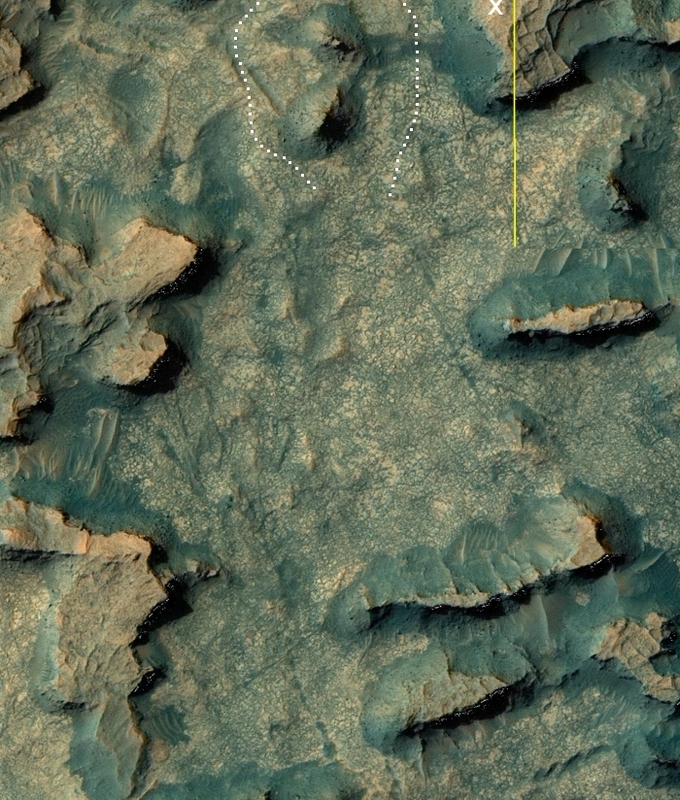 Below is part of a Mars Reconnaissance Orbiter image, showing Curiosity’s most recent position and annotated by me to highlight the view from the panorama above as well as the location of the balanced rock (marked by the “X”). I have also indicated with a dotted line two possible routes. I suspect, unfortunately, that they are leaning towards the route to the west in order to avoid being forced to cross that dark sand in the eastern gap. I also suspect that they are doing the short drive today in order to get a better idea of which way to go thereafter. Either way, the view will be quite interesting in the days ahead. 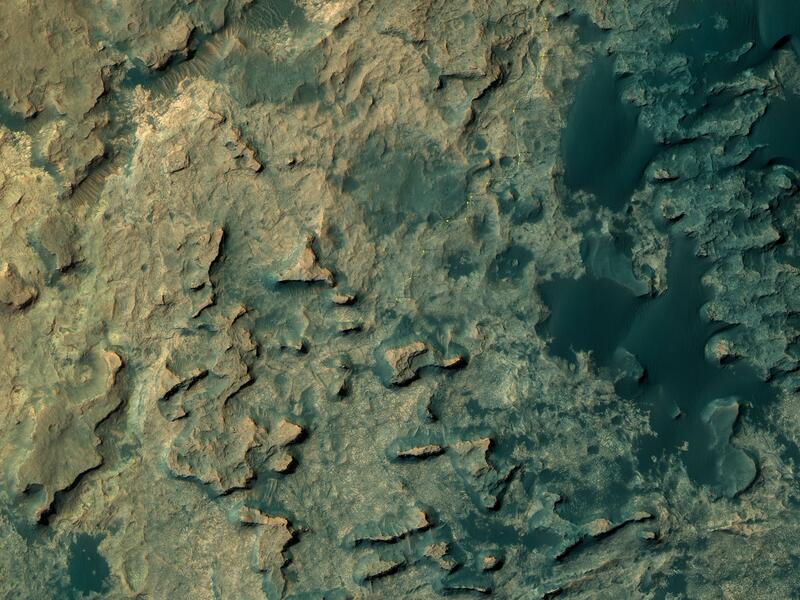 Below is another section of the same Mars Reconnaissance Orbiter image, this time showing the rough terrain ahead to the south, surrounded by sharp buttes on all sides. Beyond this the ground appears to get even rougher. 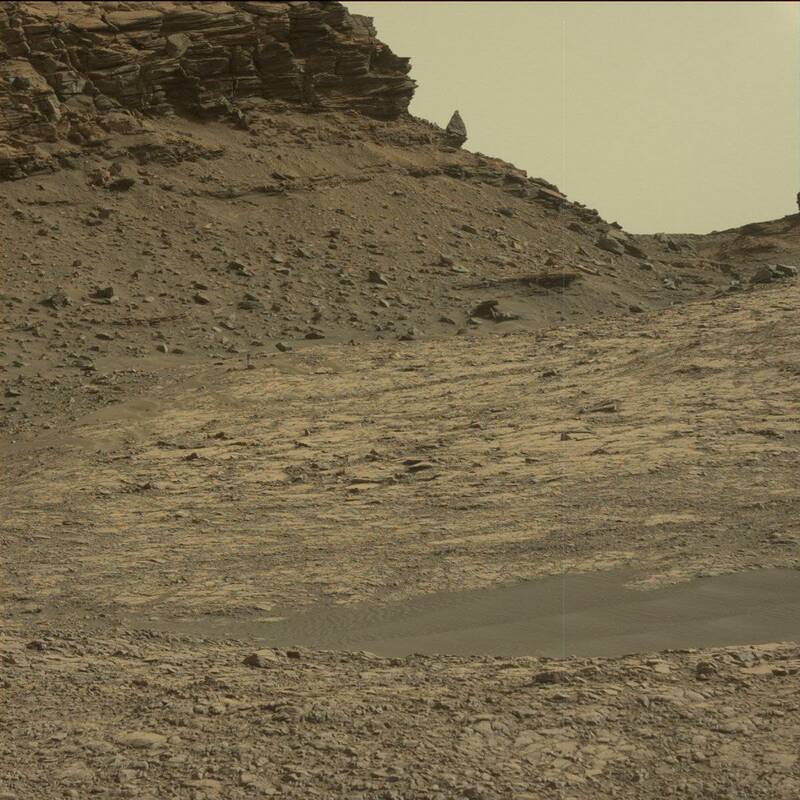 Picking Curiosity’s way through this terrain is going to become increasingly interesting in the coming days.
. . . and great scenery . . . I really like the last one, showing the balanced rock in close-up with the thin layers it sits upon very obvious as well. Hmmm, if I didn’t know better I would swear that I rode by those places while on an ATV in the Southwestern corner of Utah. I wonder if that will one day be a popular activity on Mars. 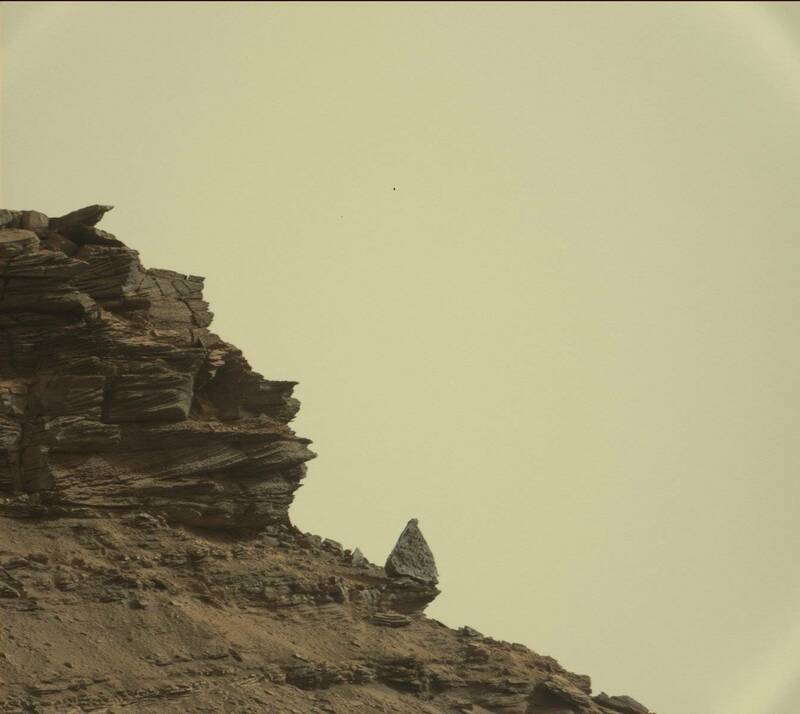 The Balanced rock appears to have fallen from higher up on the slope and landed on an outcropping of what appears to be a sedimentary layer.